Compared with a sonnet on perfumed parchment, a 140-character declaration of love doesn't seem very romantic. But you may get one soon. In a recent survey by Shape and Men's Fitness magazines, more than 65% of respondents said they had been asked out via text message. And when was the last time you sent someone a love letter? Or, frankly, any letter at all? But don't despair. In the age of texting, old-fashioned romance may seem as antiquated as Old English. Yet technology can smooth the course of true love, whether it helps find it, nurture it or, if need be, end it. Looking for your Romeo? The boom in Internet dating means there are more fish in the sea than ever before. Heading online is no longer seen as a last resort. Half the respondents in a survey by advertising giant Euro RSCG Worldwide said they knew someone who had met a partner online. With Internet dating, "you kind of go to a 'bar' and look at all potential mates very easily and scroll through them," says Patrick Markey, director of the Interpersonal Relationship Laboratory at Villanova University. For those too busy for the singles scene, online dating is a welcome shortcut, especially when profiles and photos let you be choosy about your choices. Before you even go on your first date, you can Google and Facebook your potential love to your heart's content to make sure she's not hiding any skeletons. "What people know about each other gets revealed more quickly now," says Robert Rosenwein, a professor of sociology at Lehigh University. "It may warn you off from some people so you don't have to spend time figuring out whether or not a person's right for you." So once a potential Juliet is found, what's the way to a modern woman's heart? Try her cell phone. If they're correctly organized, text messages are like stacks of love letters tied with ribbon  only now they're searchable. Paul Walker, 25, used texts to create the perfect anniversary gift for his girlfriend, Elizabeth. He created a calendar that tracked the chronology of their relationship, using only their text messages. As he was making the calendar, Walker, who lives in Brooklyn, converted his chats with her into a text document  1,200 pages long. Though the mass of messages was intimidating, the finished calendar showed the arc of their relationship. "It ended up creating a rather emotional thing," says Walker. And an overjoyed girlfriend. Technology helps not just the enamored though. In a study, Jen Eden and Alice Veksler discovered that those attempting to thwart an unwanted love have new tools at their disposal. "We found that people use avoidance tactics to maintain a status quo" in a relationship, says Eden, a visiting assistant professor at Miami University in Ohio. "And computer-mediated technology is great for that because you can think about what you want to say." If a romance goes sour, your iPhone can take all the effort out of writing a Dear John letter. In the magazine survey, 43% of women and 27% of men said they had been dumped via text message. Especially in the case of breakups, it's tough to draw the line between efficient and impersonal communication. The key seems to lie in balancing your online and off-line relationship. "Some people think it's 'add water, instant relationship' because we have access to each other's Facebook profiles," says Art Ramirez, an assistant professor of human communication at Arizona State University. 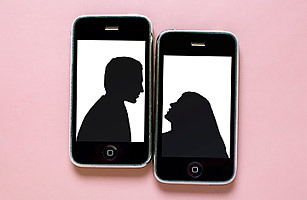 Technology just cuts out the small talk, letting you know if your partner is the right one for you. And who needs Shakespearean declarations of love anyway? If Juliet had Googled Romeo, she would have found out he was a Montague and avoided all that fuss.